There is a new kind of “machine” coming to Machinery Hill at the Minnesota State Fair this August. It’s a “music machine,” and everyone is invited to take your vocal chords for a spin. With your friends. With your family. With your church choir. With total strangers. Step up to the field of microphones and belt out the words on the giant LED screen. Don’t worry, the 32 microphones are specially designed to “auto tune” voices – or add disguising reverb and other effects. Giant Sing Along by Montreal-based artists Mouna Andraos and Melissa Mongiat is a giant sing along that puts the “together” in The Great Minnesota Get Together. It’s a machine that combines disparate voices to make common song. It’s group singing around the electric LED campfire karaoke style. It’s a make-your-own-choir opportunity. 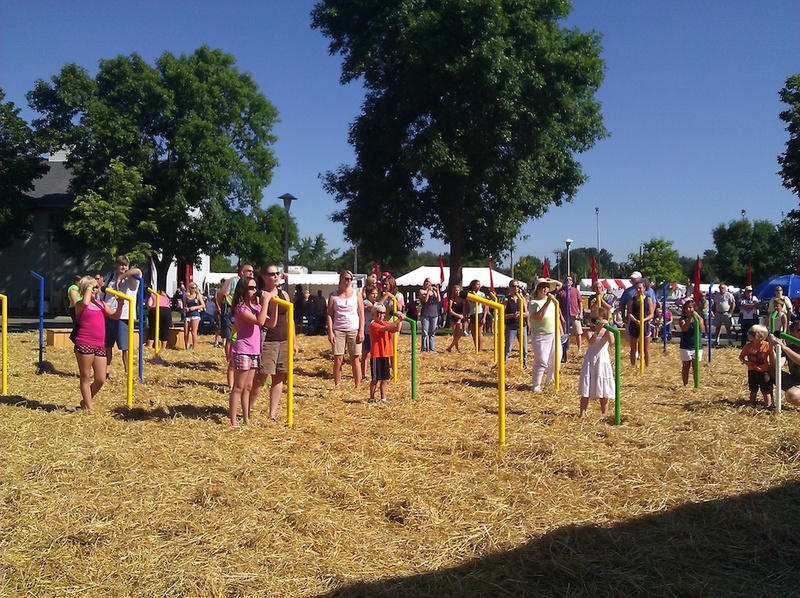 And yes, it’s song at the end of a stick – a field of stick-microphones inviting you to participate. Or watch as long as you can till you can’t resist participating. Everyone is invited. 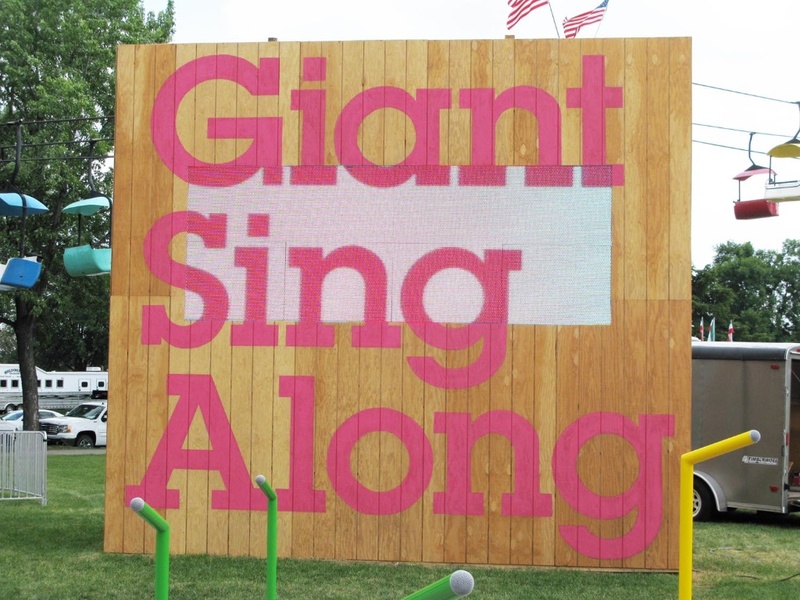 Giant Sing Along is located on Murphy Avenue, across from the Pet Center. 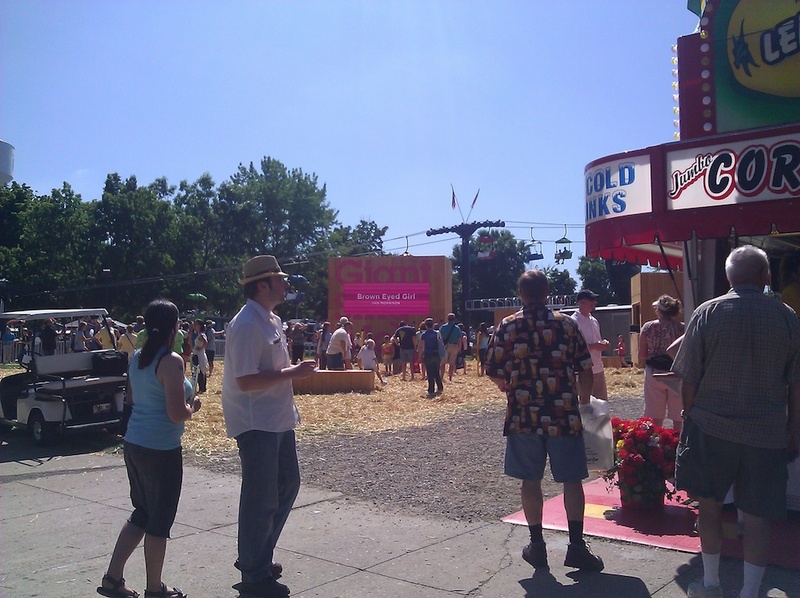 It’s free and open to all guests each day of the 2011 Minnesota State Fair from 8 am to 8 pm. 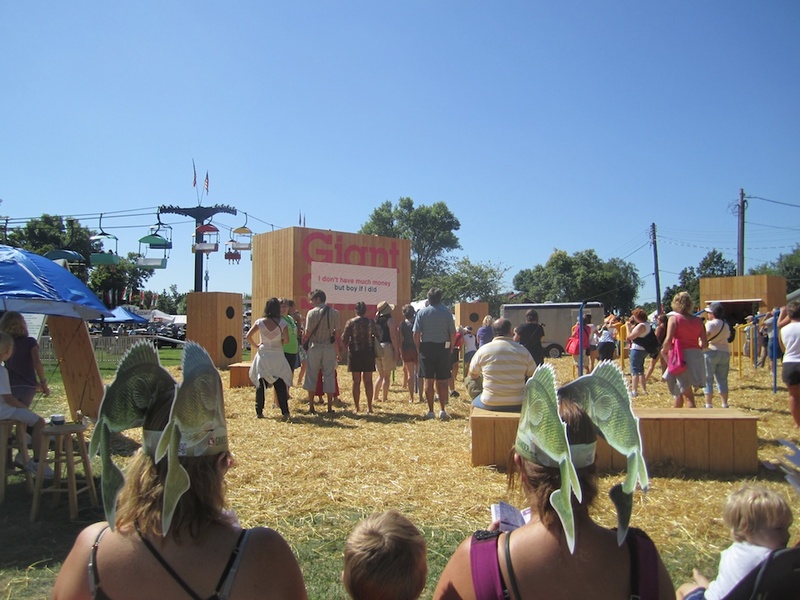 On Saturday, September 27 at 5 pm, the Prairie Fire Lady Choir will make a guest appearance at the Giant Sing Along. Giant Sing Along is part of an innovative collaboration between the Minnesota State Fair, Northern Lights.mn, and the Minnesota State Fair Foundation. 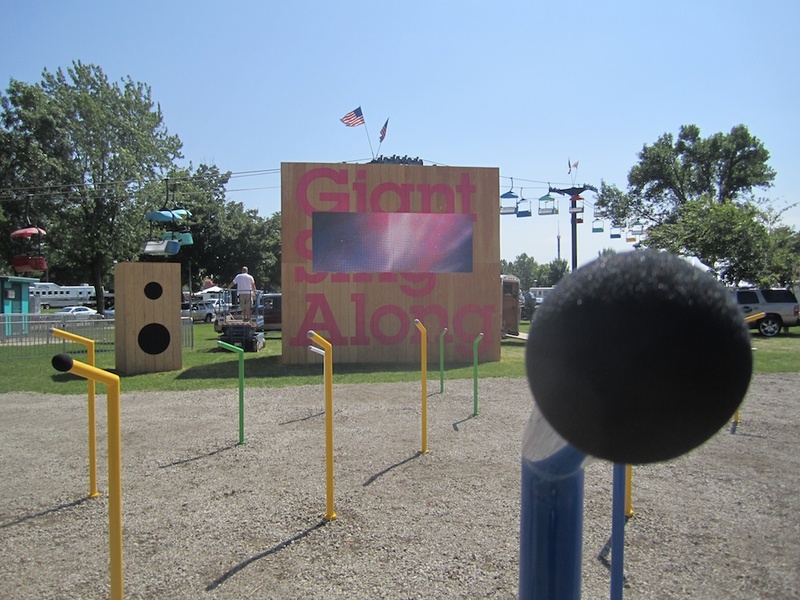 In 2010, an international panel of curators nominated over 30 artists and artist groups to propose a project for “Interactivate,” a program to bring large-scale, participatory, interactive art to the the Minnesota State Fair. From this group, four were invited to attend the 2010 Fair and make proposals for 2011: Andraos + Mongiat, Electroland, haque design + research, and SuttonBeresCuller. Every proposal was remarkable, and we would have liked to produce each, but in the end Giant Sing Along was selected for the way it tapped into Minnesota’s rich choral tradition and it’s promise to encourage direct and collaborative participation by many of the State Fair’s 1.8 million visitors. Whether at a stadium, around a campfire, on a dance floor, as part of a choir, or as a family holiday tradition, there is something powerful in the act of singing together – beyond beautiful voices, it’s about the collective shared experience. That collective shared experience is the heart and soul of both the Minnesota State Fair and Giant Sing Along. A field of 32 microphones offer an open invitation for anyone to reminisce both the historical and popular American music repertoire. A giant screen features lyrics of recent, old and very old songs, from chorals, country music and any other musical background relevant to Minnesotans through a voting process. Songs that no one can resist. The system will integrate different sound technologies to stimulate participation. A sound processing system will auto—tune the voices, lightly adjusting the pitch and reverb so that anyone, even the ones less familiar with singing, can sound good, and feel comfortable taking part. Giant Sing Along will also increase the impact of each participant’s voice: The more people sing, the more voices will come out – 1 person sounding as if 2 people were singing, 2 persons as if they were 4, 3 as 6, up to 36 voice which in turn will sound like almost 100 people are singing together. And if more than one person sings in each microphone, the sing along will truly sound giant! Andraos and Mongiat come from the fields of interaction design and narrative environments, and research new ways to tell stories. Regarding the fair’s Giant Sing Along, Andros and Mongiat write, “Building on the contagious, positive energy of the fair, participants will connect with one another by sharing in a collective and moving musical experience. This uplifting activity is accessible to all and designed with the goal of inspiring guests to do something in unison.” The two design large-­scale projects that impact cities down to tiny ones that fit inside a pocket, bringing art to everyday life and inviting the public to become active contributors. More of their work can be found at livingwithourtime.com. Presented by Bremer Bank, Giant Sing Along is a co-production of the Minnesota State Fair, the Minnesota State Fair Foundation, and Northern Lights.mn. Bremer Financial Corporation is headquartered in St. Paul, MN, and provides a comprehensive range of banking, services to its nearly 100 locations in Minnesota, North Dakota and Wisconsin. The Otto Bremer Foundation distributes charitable grants to Bremer Bank communities. For more information, go to bremer.com. Northern Lights.mn is a collaborative, interactive media-­oriented arts agency that presents art in the public sphere, including the Northern Spark Twin Cities nuit blanche, focusing on artists creatively using technology, both old and new, to engender new relations between audience and artwork. and more broadly between citizenry and their built environment. For more information, visit northern.lights.mn. 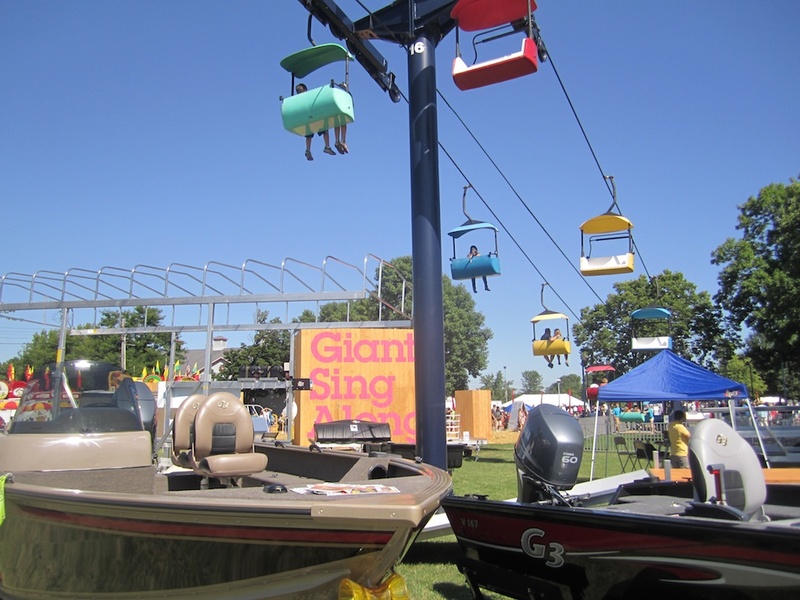 The Minnesota State Fair Foundation develops projects and raises funds for capital and program improvements on the fairgrounds, including cultural and artistic expressions like Giant Sing Along. For additional information, visit msffoundation.org. The Minnesota State Fair is one of the largest and best-­‐attended expositions in the world, attracting nearly 1.8 million visitors annually. Showcasing Minnesota’s finest agriculture, art and industry, the Great Minnesota Get-Together is always Twelve Days of Fun Ending Labor Day. 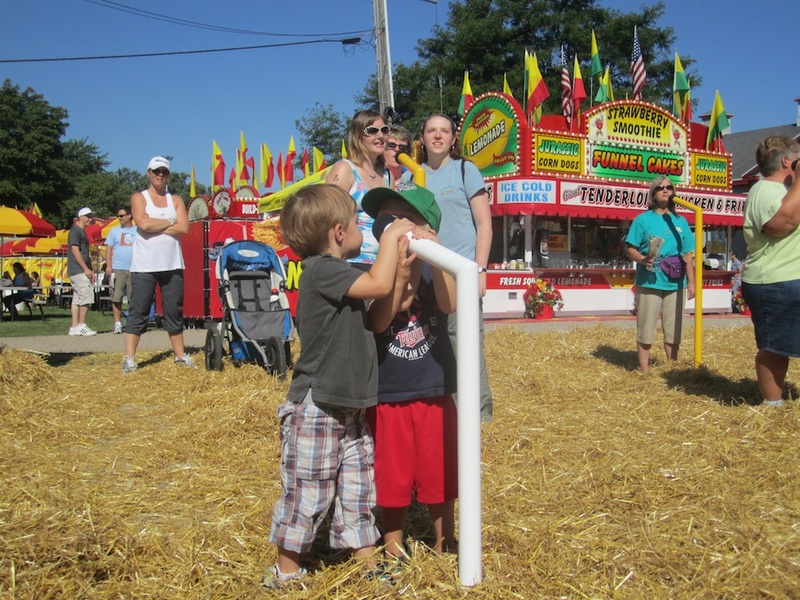 The 2011 Minnesota State Fair runs Aug. 25-­‐Labor Day, Sept. 5. Visit mnstatefair.org.